Every fall, my friends ask me "so, when are you going to the beach for your radio weekend?" Getting ready for the annual LBI DXpedition has become as much a part of my fall ritual as carving the Halloween pumpkins and raking leaves. LBI-8 marked my 7th consecutive year, and from the new DX catches to the camaraderie of the group, LBI keeps getting better every time. As is our usual practice, we tracked the space weather cycles for several months before settling on the 6th-8th of November as the dates to provide most likely optimum conditions. Reception leading up to the weekend was yielding "near-LBI quality" trans-Atlantic reception at our home QTHs so we decided that, if conditions were excellent, we would consider extending the DXpedition to a third night (which we ended up doing). Setting up the beverage antennas went without a hitch, and conditions on the first evening started out great around 4:30pm local time with the usual appearance by Sweden on 1179, followed by UK outlets, Spain, France and Germany. 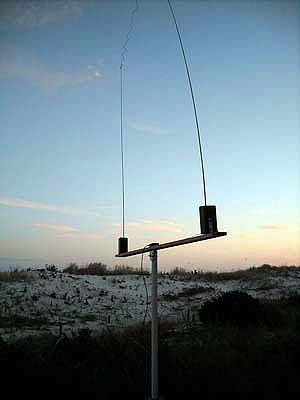 As the evening progressed some of the medium wave frequencies cooled down but longwave provided some excellent signals. On subsequent days, we were able to pick up significant TA signals on both long and medium wave as early as 3:30pm local time. A subset of the attendees decided to stay over Sunday night; conditions changed early that evening as the A-index shot up to 7 and the band went somewhat auroral. While things returned to normal after a few hours, there was a period of dominance by Latin American stations that evening. We had hopes that this year might finally yield some solid trans-Pacific reception. However, despite early morning listening and some tantalizingly strong carriers, we were not able to extract anything more than some wispy audio from the strongest of stations on 747 and 945. Other DXers further north had definite audio on these channels at the same time, but we will have to console ourselves with the fact that New Jersey just isn't an ideal location for TP DXing. Every LBI tends to yield a different mix of stations and this year was no different. 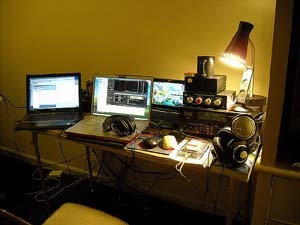 Running my Perseus SDR as a "DX vacuum cleaner" for ~18 hours a day, I recorded more than 1 terebyte of wide-band files which have already yielded a number of interesting catches in post-DXpedition analysis. Although we were not able to snag long-sought Greenland (which I had heard from Pennsylvania a few weeks earlier), we were able to positively ID the Faroe Islands on 531 and other new countries Bulgaria, Czech Republic, Slovenia and Russia. I also had digital decoding software running on my TenTex RX-320 and was able to hear Bermuda on 518 NAVTEX as well as a number of other NAVTEX and DGPS beacon stations. This year marked the return of Bobby Galerstein after several years' absence and (finally) the debut of Chuck Rippel who has been trying to attend for the previous two years. 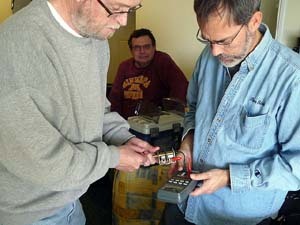 Absent was regular attendee Bruce Collier whom we missed, but he was able to send his antenna wire and pre-amps so at least a little bit of him was there. We also had visits from local radio enthusiasts Michael Temme-Soifer, Nick Langan and Steve Wozniak who were able to stop by for an evening of listening. Another years LBI is over, but the logs will keep coming thanks to nearly 60 hours of SDR recordings yet to be reviewed. I am already looking forward to next year. Everytime I arrive at Long Beach Island and take my Drake R8B out of the box, I feel as if I'm taking a thoroughbred out of the barn and releasing it at Churchill Downs. While I use a Kiwa loop with the Drake at home, this fine radio is maximized with the antenna farm that was assembled for this year's LBI DX'Pedition. I missed the two previous LBI trips due to work commitments, and had to miss the excellent conditions on Friday, also because work bekoned. But Saturday almost did not miss a beat. I arrived early Saturday afternoon, and after greeting everyone and setting up my equipment, someone in the group noticed the first TA's coming in at about 3:30. Time to grab a Sam's Octoberfest and "assume the position" in front of the radio, with a view out the sliding glass doors onto the beach and the ocean. Plus, the temperature was in the upper 50's. It doesn't get much better than this, especially with the signals coming in. While Afghanistan 1296 did not make it to our radios, I was really pleased to be able to use my phaser and null WCKY-1530 enough to get a definite log of VOA Sao Tome later in the evening. This was my first chance to see the Perseus radio in use. Most impressive, but I have to admit, I need a real radio in front of me with an analog meter. Perhaps my dream AM radio of the near future would be something on the order of the Yaesu FT-2000, which has an analog meter with an optional display. Still, Brett told me, "You'll get used to it," referring to a virtual meter. A big thanks once again to "Saylor Electronics," which supplied a couple cables and connectors beyond what I brought. One thing we missed was the presence of Bruce Collier, who had work commitments and had to miss the weekend. PArt of the texture of LBI DX'Peditons is "taking a voyage on the good ship Cutty," as prepared by Bruce, for every new country logged. Well, not every country, but it is a DX aid, hi. Bottom line, as usual, for this and every LBI experience - it's an oasis of radio relaxation with a great bunch of guys, away from our hectic work schedules. 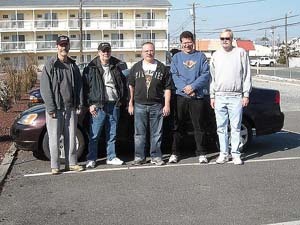 This was our most successful LBI DXpedition to date. From my perspective, the reception conditions were the best of the seven LBIs Ive attended. I was only able to stay for Friday and Saturday, so I missed out on the third night. It was great to reconnect with old friends and to meet Chuck Rippel in person. Now that I live in Albany, NY, its harder to pick up transatlantic DX, so this years outing was a real treat. 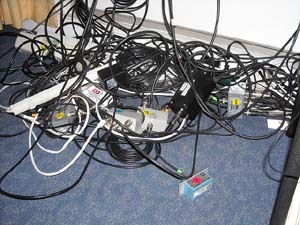 Once again, thanks to Brett for bringing every connector and cable known to man and to Russ for compiling all our logs and musings. The only downside was the absence of Bruce Collier due to illness. 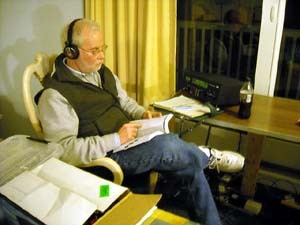 Although this was my eighth LBI DXpedition, this year somehow managed to top all of the others. As always the company is excellent, and the DX was as well. Once again for 2009, we were able to pick a weekend which turned out to feature excellent trans-Atlantic conditions, with several new countries added to our totals. Its always good to get together with the regular groups and also to get a chance to meet new faces as well, this years being Chuck Rippel, whom we welcomed to the group. We were also joined Saturday night by two new short-time visitors in Steve Wozniak and Nick Langan, both via the WTFDA connection. 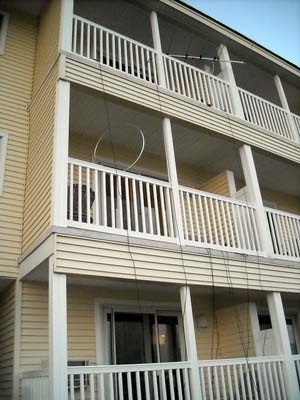 We had a new antenna added to our complement this year in the form or a corner-fed super loop which, due to the limitations on available real estate was also aligned parallel to the coastline, thus providing us with another option, and allowing us to re-orient the 6 broadband loop for other directions. For the first time this year, some of the participants stayed an extra night, however conditions deteriorated somewhat due to a geomagnetic disturbance. 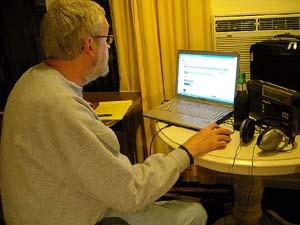 This year also featured four SDRs, two Perseus and two SDR-IQs, and in the immediate aftermath , its become quite clear that theres a very high value in having at least one SDR on a DXpedition as the ability to go back and check out unids heard by other members, to go back and check for parallel frequencies within the band are invaluable assets. That said however, our logs from the prior year were still being added to as late as August, so one DXpedition can indeed become a year-long event. We also experienced good weather conditions, although Saturday morning was rather cold, daytime temperatures Saturday, Sunday and Monday were warm and the sun dominated all three days. Our various experiments to determine whether we might be able to move from reliance on the two BOG antennas toward the super loop and broadband loops were inconclusive as Friday night most of us got our best receptions on the BOG aimed toward Europe, while Saturday the broadband loop was the star. We reeled in the BOGs Sunday while we had a full crew, so that nights DX was on the two loops, but due to the change in conditions the results were inconclusive. Next year will likely include at least one BOG and perhaps both, although each will be reduced in length to avoid problems involved in both initial deployment and periodic breakage where vehicle entries to the beach must be crossed for the longer lengths. 207 unid 11/8/2009 0434 Procol Harum "Whiter Shade of Pale" - Iceland ? Or DLF ? 530 USA unID 11/7/2009 2005 TIS type station with female announcer, mention "8am to 6pm"
630 unid 11/8/2009 0659 Short time pips every second starting at 0659:48 for 9 seconds, a pause for five seconds then a final short time pip at 0700:01. 630 Honduras HRLP Radio America 11/8/2009 0243 Soccer game in Spanish; one of the teams is Olimpia, which is from Tegucigalpa. Radio America ID. 710 Cuba various R Rebelde 11/9/2009 0013 "What About Love" by Heart, audibly out of sync with 4 carriers seen well above 710.000; // 540,550, 560, 590,600,610,620, 670,770,1180 and 1550! 747 Netherlands Flevoland Radio 5 11/7/2009 2055 Organ music (sounds like church music) from 2030 to 2045 UTC, with brief talk in presumed Dutch in between. At 2046 a talk program between two women in pres Dutch, several mentions of Nederlands. Two short and one long time pip at TOH. Another unknown station bubbled up a few times. 801 Spain various Radio Nacional 11/6/2009 2300 Time pips at TOH w/ echo from syncros, // 855 etc. 819 Egypt (p) Batrah General Programme 11/6/2009 2200 Arabic sounding music and possible call to prayer leading up to TOH, then talk by women in possible AR. 855 Spain Murcia RNE1 11/6/2009 2136 Parallel 585, 684 etc. 864 France Paris France Bleu 11/8/2009 0323 Music best described as "French Glen Campbell"
917 Nigeria? unID 11/7/2009 2233 Strong carrier on 917 started to provide het against 918 stations @ 2111 UTC; trace audio but nothing definite. 963 Finland (p) Pori Radio 86 11/8/2009 0548 Classical music with an oriental sound; per web China Radio International relays in Lithuanian at this time. 963 unid 11/8/2009 0550 Soft music, pop - Finland ? 999 Saudi Arabia? unID 11/7/2009 2339 Koranic singing similar to but not // 207 RTM A Morocco; Saudi? 999 Spain Majadahonda COPE 11/7/2009 2105 Presumed with soccer game play by play and long "gooooaaaaaaalllll"
1020 Cuba Bahia Honda CM-- Radio Guama 11/9/2009 0117 Cuban mx, time check "en Guama"
1152 Spain RNE5 snychros 11/8/2009 0621 At least two with audible network echo. 1215 Kaliningrad Bolshakovo Voice of Russia 11/7/2009 2102 Russian national anthem and ID, mixing with Absolute R.
1305 Spain various RNE5 11/6/2009 2300 female singing // 747 etc. 1323 unID 11/8/2009 0731 "Greensleeves" music - who? 1575 Spain SER synchros 11/7/2009 2201 Good over R. Farda with Spanish talk. // 1116. 1602 Spain SER synchros 11/6/2009 2321 Fair with Spanish talk.